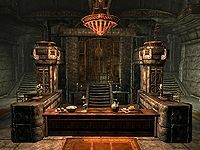 The Treasury House is the main financial institution for Markarth and the Reach. It is on the first terrace above and in the northern area of the city. It provides financial support and services for the landowners of the Reach, notably the Silver-Blood family and its patrons. All the miners, farmers, and day-laborers of the Reach get their wages through the Treasury House. Rhiada runs the front desk, where the actual treasury is kept behind an expert-locked gate. Nana Ildene (who has worked there for over twenty years) and Donnel keep things tidy. Thonar Silver-Blood, who handles all of his family's business, effectively controls the establishment. Betrid, Thonar's wife and an admitted and unrepentant gold-digger, can also be found here. 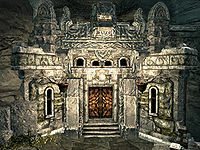 It is a large building, like all in Markarth is built into the hillside. From the entrance there is a short corridor to the main room with a large counter in front of you and raised areas in the southeastern and southwestern corners. There are stairs along the east and west wall leading to Thonar's quarters and a pair of twin bedrooms used by the employees. By the bottom of the stairs are stone tables and chairs, with numerous food barrels and sacks around the building. Most of the cookware in the building is high quality, including plates, bowls, jugs, goblets, etc. Rhiada will be stood behind the counter and make you unwelcome with comments about it only being for the employees of the Silver-Blood family. On the counter is a wooden bowl containing a dragon's tongue flower, two red and a green apple on a wooden plate, a bowl containing a sweet roll and a plate with two more dragon's tongue flowers on it. While under the counter is a collection of cookware, a bunch of juniper berries, a bottle of alto wine, a bottle of Nord mead, a lute and a flute. to the rear of the counter is a flight of stairs up to an expert-locked gate concealing an expert-locked safe with three silver ingots on each side of it. On the raised section in the southeast corner is a woodcutter's axe on a barrel, a gourd on a crate and a cabbage on the floor. The table by the stairs holds the same as the other one, except it has a bottle of wine instead of alto wine. At the top of the stairs is a junction with a twin bedroom to the east and west. The one to the west consists of two owned single beds, one against a ledge to the south and the other against a ledge to the north. On the first ledge is a bottle of wine, a loaf of bread, a sliced goat cheese, two red and a green apple, while on the second ledge is a copy of Scourge of the Gray Quarter and a steel dagger. Against the west wall is a dresser containing clothes and with a piece of silver ore and bottle of alto wine on top. The bedroom to the east consists of another two owned single beds, one against a ledge to the north and the other against a ledge to the south. The ledge to the north has a copy of Nords Arise!, a small coin purse and two loose septims on top and the ledge to the south has two bottles of Nord mead on top. To the east is a tall wardrobe with a bottle of wine and a sliced goat cheese on a crate to the right. By the raised section to the southwest is a kettle containing two cabbages and a potato, while on the raised section is a round wooden table with a bottle of alto wine and a bottle of wine on top. Along the west wall is a dresser, with a small coin purse on a barrel to the right and further right is a stone ledge with a red apple in front of a copy of the Archery skill book Vernaccus and Bourlor. The stone table by these stairs has two wooden chairs and has a bottle of alto wine, a baked potato, a red apple, a loaf of bread and a goat cheese wedge on top. Betrid Silver-Blood spend all her time sat at this table. In the northwest corner, up the stairs is the door to Thonar's quarters which is apprentice-locked. His quarters consist of two rooms, the first has a central stone table with two chairs. It is laid with plenty of cookware as well as a bottle of wine, a baked potato, two salmon steaks, two portions of grilled leeks, a bulb of garlic, a rack of dog meat, three loaves of bread and several pieces of cheese. There is an alcove to the west with an owned single bed in against the west wall with a ledge running along the wall holding a copy of The Cake and The Diamond. To the left of the alcove is a set of shelves holding two loaves of bread, a cabbage, a potato in a cast iron pot and several pieces of cheese, while to the right of the alcove is an unlocked chest containing minor loot. Against the east wall is a large fireplace with a cooking pot in front and a pot containing a cabbage and a wooden bowl containing two red and a green apple on either side. To the left of the fireplace is a food barrel with a goat cheese wedge on top and a basket on the floor containing a gourd and two cabbages, with a rack hanging from the ceiling above it holding a rabbit, a garlic braid and a bunch of frost mirriam. To the north is a doorway into a small bedroom most of which is taken up with a large double bed coming out from the north wall. To the right of the bed, on a stone ledge is an unusual gem with a long end table against the west wall. On top of which is a bunch of tundra cotton, a silver jeweled necklace, a large coin purse and a bowl containing a sprig of snowberries and three bunches of juniper berries, while against the east wall is a tall wardrobe. There is a Loot shadowmark to the bottom left of the entrance door. During the Forsworn Conspiracy quest all or most of the occupants will be killed.